Kotak Securities Ltd was established in 1994. It is a subsidiary of Kotak Mahindra Bank. Stock broking services and financial products are offered in India. They have 1209 branches, franchisees and satellite offices. They offer services to 11.95 Lakh customers. They have membership in with the Bombay Stock Exchange and the National Stock Exchange. They are also a depository participant with National Securities Depository Limited (NSDL) and Central Depository Services Limited (CDSL). The account enables them to credit funds required automatically which makes them operate with ease. They can trade in Equity, IPO, Mutual Fund, ETF, Tax free bonds, Currency Derivatives, Gold ETF etc. Option 1: Contact Us form is available on the website. The required information like name, mobile number, email address, and location has to be filled. A Kotak securities representative will contact you. Option 2: The form can be downloaded from the website; the required details should be filled and handed over to their registered office. Kotak Securities Account Opening Form, Name Change Request Form, Kotak Securities Account Closing Form etc. are available on their website. One can fill the form as per their requirement and submit it to their registered office. Kotak Securities offers multiple trading platforms to suite investor's requirement. Website Based Trading - - A stock trading website which can be accessed though any popular Web Browser. Xtralite, a light weight trading website which is offered by Kotak can be used by investors with slow speed internet. 1.Trading Terminals (KEATProX and FASTLANE) - KEATProx and FASTLANE Kotak offers two different trading terminal based application which are very popular among stock traders. KEATProX is an exe based installable desktop application providing fastest trading experience. FASTLANE is a Java applet based application which gives you a trading terminal kind of experience without any installation on your computer. FASTLANE gives KEATProX like features and the benefits of website based trading as it can be accessed from anywhere though web browser. 2.Mobile Stock Trading - Kotak offers high speed mobile based application to trade in Stock Market. The app provides the facility such as Execute Trades, Monitor Portfolio, View Streaming Quotes and Intraday Charts. 3.Branch Advisory and Call & Trade - Kotak also offers trading facility though its 1400+ branches and through call centers using call & trade facility. AutoInvest is a unique Online Trading Account which provide investment planning in Gold ETFs (Exchange Traded Funds), Equities and Mutual Funds to their customers. Gold ETFs are mutual fund schemes that will invest the money collected from their investors in standard gold bullion. Kotak Gateway account opens the gateway to a world of investing opportunities for beginners. Kotak Gateway user can trade anywhere, anytime using internet. Kotak also offers call and trade facility. Investor can also trade Currency Derivative using Kotal gateway account. Kotak Securities provide SMS alert, research report, free news and market updates to the account holders. Best feature of Kotak gateway is call and trade facility. Anybody can activate Kotak Gateway account with any amount between Rs 20,000 to 5, 00,000. This can be in the form of cash deposit or the value of the shares you buy. Brokerage will be charged based on the account type. For intraday, trading brokerage is .06% both sides for less than 25 lakhs and .023% for more than 25 crores. Kotak Privilege Circle is the premium investment account offered by Kotak Securities. Along with Kotak Gateway account benefits Kotak provides independent market expertise and support through a dedicated relationship manager and a dedicated customer service desk which provides assistance in opening accounts, handling day-to-day problems, and more. They provides KEAT premium which is an exclusive online tool that lets you monitor what is happening in the market and view your gains and losses in real-time. Kotak Privilege Circle account can be activated with any amount more than Rs. 10,00,000 as margin, by way of cash or stock. For intraday trading brokerage is .06% both sides for less than 25 lakhs and .03% for more than 25 crores. 4.Kotak Freedom for Mutual Fund Investments. 5.Kotak Super Saver, a Flat Brokerage and a Low Margin account. 6.PMS (Portfolio Management Service)L: In order to manage the investments, this account is created. 7.NRI Account, a online trading an investment account for NRI investors. 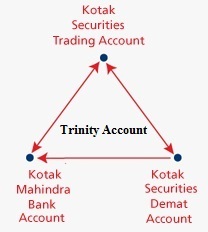 Trinity Account is an integrated account that helps investors enjoy the benefits of a Online Trading Account, Bank Account, Demat Account on a single platform for your securities transaction. This account gives convenience of fund transfer and online trading. Opening an account with Kotak Securities Ltd? 2. Visit one of their nearest branches..
Kotak Securities Dynamic Brokerage Plan is specifically created for those Customer who are frequent traders and looking for a good bargain on their brokerage rates. Get detail about Kotak Securities pricing, Kotak Securities brokerage calculater, Kotak Securities brokerage, Kotak Securities plans, Kotak Securities brokerage review, Kotak Securities brokerage plans, Kotak Securities fund transfer, Kotak Securities intraday brokerage, Kotak Securities charges, Kotak Securities charge list, Kotak Securities charges calculator, Kotak Securities prepaid brokerage plans, Kotak Securities yearly charges, Kotak Securities fees, Kotak Securities yearly maintenance charge, Kotak Securities option brokerage and Kotak Securities trading charges. Kotak Securities website provides wide range of investment options. This includes investment in equity, IPO's, Bonds, FD's, ETF's, Mutual Funds, Currency Derivatives etc. Along with the online trading facility, customer gets access to 1400+ branches for help on investment and issue resolution. Kotak Securities provide daily SMS alerts, market pointers, periodical research reports, stock recommendations etc. to support the customers. Online Chat facility is available too. Kotak security offers easy integration of trading account with Citibank, HDFC Bank, UTI Bank and Kotak Mahindra Bank. Kotak Securities is a Full Services Broker. The brokerage charged by them is higher than the Discount Brokers. Number of customer complained against Kotak Securities Ltd share broker. The Kotak Securities Ltd consumer complaints provide the summary of grievance which went to exchange for resolution.